Yes, that is Scarvok’s capital ship. And yes, this means the flying egg is no more. Now you’ll just have to get used to the flying iron. Sombulus: Sombulus is a humorous fantasy adventure in the spirit of Discworld and style of a shounen manga. A zealous paladin, brilliant energy harvester, and curious spiky haired tinkerer set off on fantastic adventures through the strange, surreal, magical and mystery-riddled Myriad Worlds of Sombulus, leaving each place a little more weird than the last. Give these two a read. There’s good stuff here! You can leave comments by clicking here, leave a trackback at http://supervillainous.spiderforest.com/comic/back-to-work/trackback/ or subscibe to the RSS Comments Feed for this post. Minus 1 good parenting point for not letting her be like her ‘hero’, but plus 10 for not letting her become a villain (at least not yet). And, Daddy needs to rebuild the villain cred on the street. That’s not a flying iron! It’s a flying hot-rod! Look at it! It’s got frontal-detailing, rear spoilers, headlights, pointless wind-directing gap-thingys. Oh, and, Kaley, remember, he might be a Supervillian, but he’s still your Dad. His first priority is keeping you safe. If you want to enter Super-Villainy, you need to wait until you’re 18 and start it alone just like everybody else. Though, in your case, you’ll also have to move out of home, just like the kids of Super Hero’s. Not sure if those kids are becoming newbie Super Villains or Super Hero’s, though. It honestly looks like a shoe to me. honestly the ship looks like a hand held vacuum cleaner to me. I think it shapes up nicely to be Claw’s new ship. 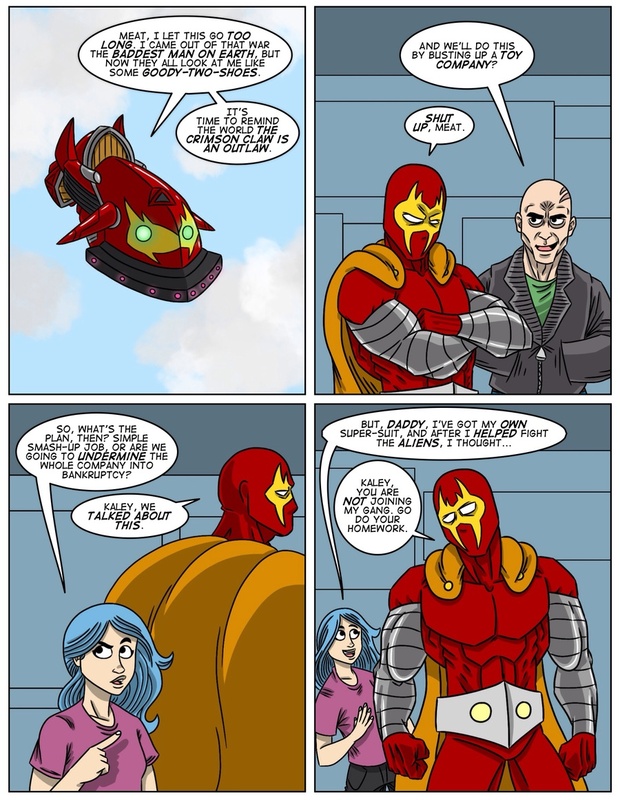 I think that today’s comic embodies more aspects of what makes Supervillainous great than any other single day. It has it all: larger than life super-villain, dedicated father, snark, over the top reactions, and even the cheesy technology. A perfect page to send to new readers.